Find GMV content using tags! It is good to be aware of the different types of export formats and data viewers that are available for the datasets that you generate throughout a project. Export formats are commonly specific to the scanner that you are working with and the type of dataset that is generated (i.e. point cloud, polygonal mesh, CAD file, etc….). Hint: You can click on any image to see a larger version. C10 data are point cloud datasets that are typically exported from Cyclone as either PTX or PTS files. Both PTX and PTS are Leica proprietary formats. What is the difference between PTS and PTX? PTX files retain all of the information from the original scan plus additional registration information. This includes the scanner location and transformation matrices that have been applied to the scan in the registration process. Information provided in PTX files specifically the scanner location are important if you want to create a polygonal mesh from a scan dataset. Use the PTX format to export individual scans and registered datasets prior to unification (in Cyclone). Once a dataset has been unified, the individual properties of a scan are lost. Many scan packages including Polyworks, Rapidform, and MeshLab read the PTX format and offer meshing operations that will allow you to create a polygonal mesh from a PTX. If you are going to create a mesh from C10 data, it is advised to mesh each scan individually. The PTS format is often described as a “dumb format” because it does not retain any original scan or registration information. In this regard, it is very similar to the ASCII file format. The PTS format is often used when exporting final registered point clouds that have been unified in Cyclone. Also, the PTS format is often used in place of the PTX format for import into software that do not directly support PTX files. ASCII is a non-proprietary format that does not retain any data organization and is recognized by most software packages. It is a simple text based format that stores each individual point as XYZ*RGBI (where RGB is color information and I is intensity). *Color and intensity only available when collected by the scanner. ASCII is commonly used when archiving scan datasets as it does not require special software for interpretation. When archiving individual scans and registered point clouds, export them in the ASCII format using the TXT extension. Data can be exported directly from ModelSpaces or ControlSpaces in Cyclone. Simply open the desired file and go to File – Export and choose the desired export format (PTS, PTX, or ASCII TXT). In addition to the exports mentioned above, C10 datasets can be exported and viewed in Leica TruView which is a web-based program often used for the sharing and visualization of C10 data. Breuckmann SmartScan HE data are stored as polygonal mesh files in the OptoCAT software. You may wish to export each scan individually for additional processing in another software or you may want to export a final merged mesh file. Scans can be exported the following formats: ABS, BRE, CTR, and PLY. ABS, BRE, and CTR formats are Breuckmann proprietary formats whereas the PLY format is a common 3D model exchange format that supports RGB information. 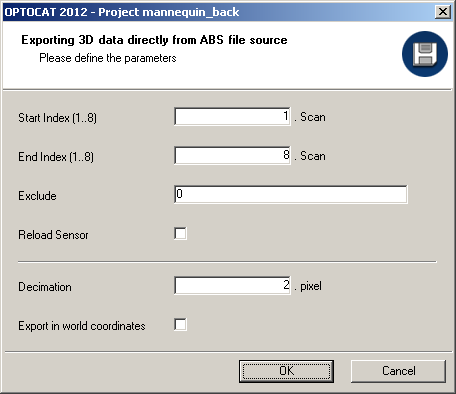 While you would rarely export data in the ABS format, it is useful to know that ABS is the original raw scan file. The BRE and CTR files are polygonal mesh files that retain the most recent project parameters applied to a project in OptoCat. These parameters include 2D and 3D filters and mesh compression and are discussed in more detail here http://gmv.cast.uark.edu/7407/optocat-project-templates-2/. To export BRE files from OptoCat, select Tools from the left side bar and then click BRE Export. Next, enter the scan #’s that you wish to export and click OK. In the example below, scans 1-8 were exported as BRE files. CTR (Container) files are stored in the OptoCat project directory in the CTR subfolder. 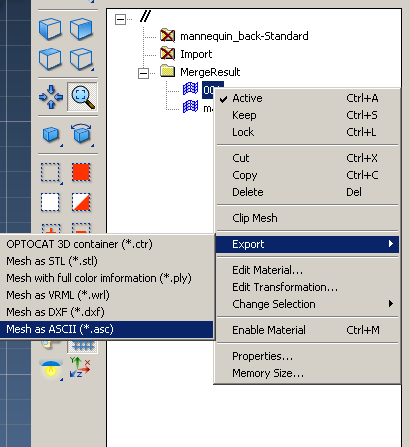 Container files can either be exported by right clicking on a scan in the table of contents and selecting Export – OPTOCAT 3D container (*.ctr) or the user can directly access the files by opening the CTR folder in Windows Explorer or another software. Rapidform XOR directly imports CTR files. Finally, the PLY format is a common exchange format for polygonal mesh files produced from 3D scanners and of all the formats is the most supported by other software. To export a scan as a PLY file, simply right click on the scan in the Table of Contents and choose Export – “Mesh with full color information (*.ply)”. Merged datasets consist of individual scan files that have been merged together to form a single polygonal mesh file. Users can conduct typical mesh post processing operations (i.e. hole filling, smoothing, etc..) on a merged dataset in OptoCat or they may wish to export the mesh for post processing in another software. Whenever you are ready to export your merged mesh file, export the file using the PLY format. The PLY format is a common exchange format for polygonal mesh files produced from 3D scanners and is well supported by other 3D packages. Simply right click on the merged file result in the table of contents and choose Export – “Mesh with full color information (*.ply)”. Please cite this document as: Payne, Angie. 2012. File Formats – Exporting your data.CAST Technical Publications Series. Number 9320. http://gmv.cast.uark.edu/uncategorized/file-formats-exporting-your-data/. [Date accessed: 22 April 2019]. [Last Updated: 22 March 2018]. Disclaimer: All logos and trademarks remain the property of their respective owners.